Hydrofluoric acid (HF) is an ideal etchant for all silicon oxide types used in micromachining, since it allows fast etch rates and is highly selective against silicon. A typical application for HF etching is the removal of sacrificial oxide layers in MEMS fabrication. However, as is typical for liquid-phase etchants, there is a high risk of the movable structure sticking to the substrate due to the effects of surface tension. AMMT's HF Vapor Etcher solves this problem by working entirely in the vapor phase. The HF Vapor Etcher is perfectly adapted to surface micromachining, SOI-MEMS, dicing-free release, structure thinning, and many other applications. The wafer is mounted onto the reaction cell with the etching side facing down. HF vapor is generated passively from a small liquid reservoir at the bottom of the reaction cell. 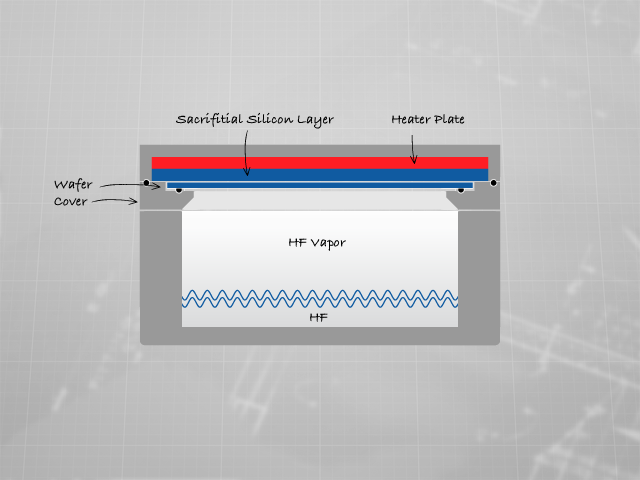 The HF vapor reacts with the SiO2 on the wafer surface to form volatile SiF4, which desorbs readily from the surface. The reaction also requires small amounts of water to be present on the surface. In order to ensure a microscopic water film on the surface without producing droplets which could cause sticking, the wafer is gently heated from the backside by an HF-resistant precision heater plate. The water film on the wafer is evaporated at temperatures being just a few degrees above room temperature. The etch rate decreases with increasing temperature and stops completely at temperatures above 50°C. 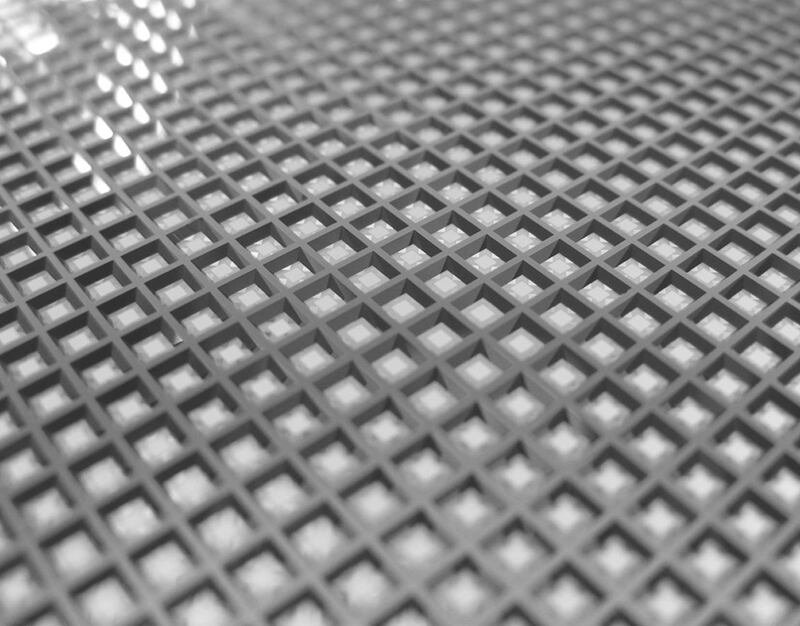 An excellent etching homogeneity is achieved by our special heater design, which minimizes temperature gradients over the wafer that could affect the etch rate. Typical lateral etch rates for the thermal oxide are in the range of 3 to 5 µm/hr, those of CVD oxides can be two times higher. AMMT offers two different HF vapor etching setups. While the HFVE Basic follows a straight forward approach and is primarily designed for R&D environments the HFVE System comes with a dedicated HF handling system which automatically pumps and drains the HF. Both systems share the same wafer mount and heated head stage allowing an easy and cost effective upgrade from the FVE Basic to the semi-automated HFVE system. Fig. Polysilicon membrane of a surface-micromachined pressure sensor. The cavity underneath the membrane has to be fabricated by selective removal of a TEOS silicon oxide layer. The membrane is fully released and does not stick to the substrate after the etching process.